Beat bloat and discomfort with the scientifically proven, easy-to-follow, low-FODMAP plan. 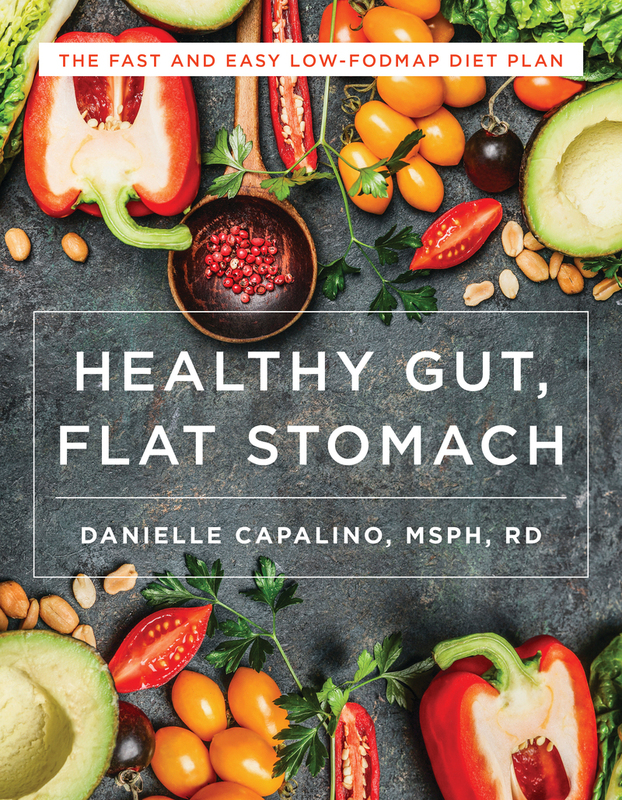 Danielle Capalino, MSPH, RD, CDN, is a registered dietitian providing nutritional counseling on digestive health. The author of Healthy Gut, Flat Stomach, she lives in New York City with her husband and son. From vegetables and fruits to eggs, cheese, and nuts, Leda Meredith unlocks the secrets to pickling everything. As a vegan, where do you get your protein? As enduring as our love of bacon, Bacon 24/7 will satisfy new readers in this expanded second edition with 6 new recipes. Get away from it all— but keep eating well! 75 recipes for beauty from the author of Zen and Tonic. 100 accessible recipes that will appeal to even the pickiest eater. Now in a friendlier size and format, The Ultimate Protein Powder Cookbook is a fan favorite. An effortless—really!—approach that turns the body into a fat-burning machine. Drink to your health with fresh herbs, spices, and natural sweeteners. 75 all-natural, gluten-free, soy-free, vegetarian recipes. What to drink when you’re expecting. Discover new ways to savor your favorite beer with 60 traditional and inventive recipes. Vegan cheeses that taste like the real thing—but healthy—made with nuts, seeds, tofu, or vegetables. High-protein desserts that taste great, are easy to make, and serve one or two. Sweet slowcooker! Make dessert ahead of time and keep it warm and gooey for serving. Christina Lane is back, with more favorite sweet treats—scaled down for two! More than100 recipes to cook in one pot! More than 100 sticky, gooey, sweet creations, as easy to make as they are delicious. Frozen desserts that even acaveman would love! What has your blender done for you lately? A taste of pie in half the time and a quarter of the effort! When you’re short on time, you’ll love these big-on-flavor,crazy easy meals. Grab your apron and fire up the grill! A stocked freezer is a busy cook’s best friend—frozen ingredients arethe key to a quick and delicious meal. Please your palate as well as your wallet! With Judy's help, cook from your cupboards--you'll be amazed at how well you'll eat tonight! Prompted by a found notebook of illicit booze recipes, here are morethan 100 secret and forgotten formulas for cordials, bitters, spirits, andcocktails, gorgeously illustrated and explained. Busy moms and dads will appreciate these quick, simple, classic recipes, all of which can be popped into a slow-cooker early in the day so it’s ready to eat by the time everyone is home from school and work. Whether you're lazy or just crazy busy, if you love homemade desserts but don't have time to bake, this book is for you. More desserts for two—plus brunch, lunch and dinner—easily adjusted should unexpected guests drop by! Try a variety of tasty jerky treats made with meat, veggies, tofu, and more! Taking cupcakes to the next level is a specialty of Cupcake Wars —here are recipes from one of its popular winners. A comprehensive primer to the bountiful variety and deliciousflavors in vegetarian cuisine from the revered Kripalu Center for Yogaand Health. Previously fallen from grace, vermouth is once again the next big thing in spirits. News flash: Your body already knows how to detox; you just need to turn on the right cues to make it happen. Here's how, with a 14-day plan that will change your life forever. Cut the Carbs by Tori Haschka shows how to ditch white carbohydrates and eat low-GI "smart-carbs" instead. Inspirational! Satisfy your sweet tooth with complex carbohydrates—no white flour here! A perfect introduction to the joys of paleo baking. Dessert for Two takes well-loved desserts and scales them down to make only two servings! You'll be amazed at what your blender can do for you! Microgreens: The new superfood you grow in your own kitchen! Chia, Quinoa, Kale, Oh My! There's a superfood for everyone! Here's how to find and cook with your favorites. You can't survive on green drinks alone! For good health, try Katrine Van Wyk's recipes for nutrient-dense collards, kale, broccoli, and other green vegetables. A compendium of delicious soup and stew recipes that just happen to be gluten- and dairy-free. Make your own dry-cured pork delicacies at home with the know-how you’ll learn from this book. Baking with Biscoff spread--the addictive and gingery cookie butter that's swept the food blogger world. Finally, recipes for healthy, delicious, and easy gluten-free, grain-free breads, muffins, cookies and more. Pumpkin is a delicious and nutritious addition to your diet -- it's a versatile superfood that you can find at your supermarket! A veritable around-the-world of soup recipes, all scaled down to feed one, two, or a few. Hang on to your pie plate— King Arthur Flour Whole Grain Baking will change the way every baker thinks about whole grains. Make your cake and eat the whole thing, too! Imagine making a delicious, praise-worthy cake wihtout measuring, mixing, or even breaking an egg. The avocado has broken out of guacamole to become a produce star. The ultimate guide to putting up food. Photographer and author Roger Phillips has compiled a wide-ranging, delectable guide to finding and cooking wild foods. Unlike other books that focus on foraging, Phillips gives detailed recipes and preparation instructions that are critical to cooking and enjoying wild foods. Virtually every cuisine in every culture around the globe has something approximating a noodle. We’re familiar with macaroni and cheese, spaghetti, and Asian noodle dishes, but A World of Noodles shows home cooks how much more there is to explore. Greek yogurt really shows its versatility in cooking, as it won’t curdle like traditional yogurt. In this handy cookbook, learn how to make healthier comfort foods, such as Macaroni and Cheese, Seafood Chowder, and Greek Yogurt Chocolate Mousse. Model-turned-nutritionist Katrine van Wyk shows you how to take your veggie smoothie to the next level, by enhancing its beneifts with added protein, fiber, and superfoods like as acai and bee pollen—all to make sure your body's enjoying, truly , the best green drink ever. People everywhere are waking up to the extraordinary health benefits of coconut oil. Rejoice, then, in more than 75 mouthwatering, gluten-free, grain-free coconut oil and coconut flour recipes paired with beautiful photographs. In this storybook-cookbook the authors translate some of the 1001 Arabian Nights stories Scheherazade recounted for Shahryar and adapt ancient recipes for the traditional sweet treats mentioned in them. This vibrant, lovely book brings modern cooks delicacies from one of the world’s magnificent civilizations. Recipient of the coveted James Beard Award for best Healthy Focus cookbook, The Simple Art of Eatingwell is perhaps the definitive guide to healthy eating. It includes the best recipes and advice from nearly 20 years of experience at EatingWell Magazine. Drawing on the same commitment to the home-baking community that has earned them hundreds of thousands of dedicated followers, the bakers at King Arthur Flour guide you through hundreds of recipes, revealing the secrets to making your own mouthwatering cookies for any occasion. Relish what you eat, because good things happen around the table. From one of the nation’s leading cancer centers, a bright, flavorful cookbook to help patients and their caregivers. The trusted companion of scores of home bakers is finally available in paperback! All you need for healthy, easy, fabulousmeals that are full of flavor is one potand this cookbook. With recipes like these,you’ll never miss the meat! Brother Victor offers more simple and elegant vegetable recipes. Finalist for a 2011 James Beard Foundation Award in Healthy Focus: At last—the comprehensive guide to cooking and eating healthier from that most trusted authority: EatingWell . Master the art of baking with the expert help of The Original King Arthur Flour Cookbook from Countryman Press! A wonderful new collection of recipes from a revered cookbook author—every cook and kitchen will delight in these 200+ recipes. Who says it has to cost more to eat well? Do you love food but hate “diets”? Do you want to be healthy and fit but find yourself too busy or simply at a loss about what to make for dinner? Then this book is for you. Nearly 200 easy recipes, cooking and shopping tips, and nutrition advice to make your favorite classic recipes healthier. This new cookbook from the author of A World of Dumplings features over 100 easy-to-follow recipes for everything from down-home fried green tomatoes and classic ketchup to spicy gazpacho, and even sweet and succulent desserts. This information-packed book offers up sound nutrition advice on why eating delicious fresh fruits and vegetables will help you live longer, feel better and keep the weight off. A science-based plan that brings together cutting-edge, university-tested weight-loss strategies with delicious, quick, and easy recipes. A leading heart doctor's program that could cut your risk of heart attack by more than 50 percent just by making a few changes to your diet and lifestyle. From the award-winning kitchens of EatingWell come hundreds of easy-to-prepare, full-flavored, satisfying recipes the whole family can enjoy. The cookbook for making dumplings and small pies of all kinds, from pot stickers, ravioli, and knish to empanadas, pasties, and samosas—and many, many more. A combination cookbook and food-lover's guide to the finest inns in the country. A fusion of simplicity, healthy ingredients and just-right quantities, these delicious, exciting new recipes are designed for today's growing world of empty-nesters, couples without children and smaller households. A James Beard Award finalist: "User-friendly recipes for people to take nutrition seriously. "—Florence Fabricant, The New York Times. Never again sacrifice delicious, healthy meals when time is short: Here are more than 150 recipes that can be cooked in 30 to 40 minutes or less. A comprehensive primer to the bountiful variety and deliciousflavors in vegetarian cuisine, from the revered Kripalu Center for Yogaand Health. From Christmas cookies and pancakes to chocolate cake and sandwich bread, The King Arthur Flour Baker's Companion will be there to guide home bakers every step of the way. In recent years the number of artisanal and farmstead cheesemakers in Vermont has exploded. These dedicated craftspeople make distinctive, high-quality cheeses from the milk of their own cows, sheep, and goats; age them in their own caves; and ship them to restaurants, gourmet food markets, and cheese lovers all over the world. Convenient and delicious meals for the warmest months. More than 100,000 copies sold!